Martin Magnusson currently heads a research group of 7 people, two PhD students, two post docs and three research nurses. He has been main tutor for one completed PhD project ”Metabolic actions of atrial natriuretic peptide”. Martin Magnusson is the head (PI) of three major on-going prospective major research projects 1) Competence Centre Heart and Diabetes (CCHD), 2) SCAPIS sub-echocardiographic examination trail in Malmö and 3) Heart and Brain Failure Investigation study (HARVEST) and also part of the steering committee of the clinical project “Metabolic Health” Skåne University Hospital. 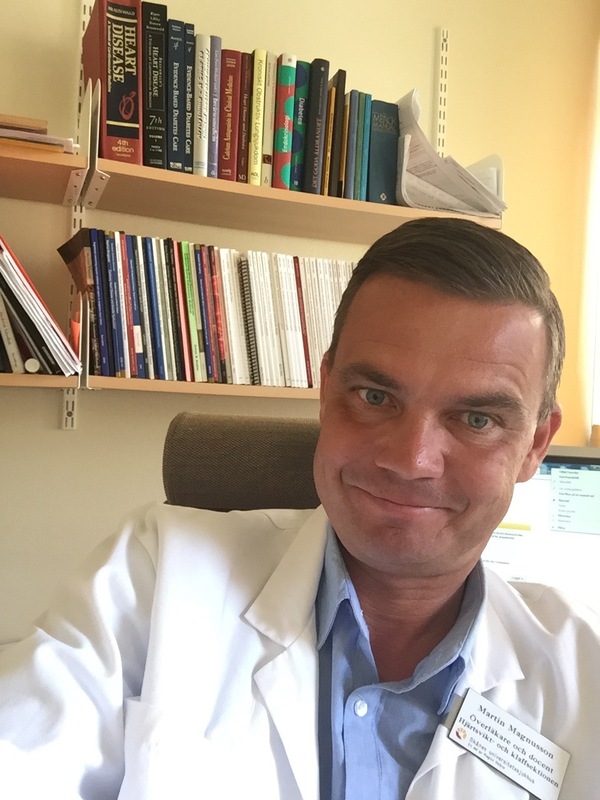 In 2017 Martin Magnusson was granted the prestigious “Research Space for young clinical scientists in Wallenberg Center for Molecular Medical Research at Lund University (WCMM LU) ​​years 2017-2021 – regeneration and reparation in diabetes”. Martin Magnusson is a highly innovative and productive clinical scientists, with the majority of his publications in the US and European top journals, and represents one of Skåne University Hospitals future core group of young researchers, i.e. those who develop strong clinical activities relating to research of both direct clinical and but also of complex molecular, genetic and biological nature. Jansen van Vuren, E., Malan, L., von Känel, R., Martin Magnusson, Lammertyn, L. & Malan, N. T., 2018 Dec 17, In : Diabetes and Vascular Disease Research. The initiative to the Wallenberg Centres for Molecular Medicine (WCMM) was taken in 2014 by the Knut and Alice Wallenberg Foundation (KAW), by an investment in the range of SEK 1 billion over ten years in four research centres at the universities of Lund, Gothenburg, Umeå and Linköping. Close cooperation between the Wallenberg Centres for Molecular Medicine at Lund University and WCMM centres in Gothenburg, Umeå and Linköping and also SciLifeLab, will thereby create the conditions for the optimal use of resources and expertise in Swedish life science research. The coordination with university health care in Region Skåne is crucial for WCMM at Lund University. Through integrated research environments, the conditions for world-leading molecular and translational research are to be set up. The aim of the Swedish CArdioPulmonary bioImage Study (SCAPIS) is to predict and prevent cardiovascular disease (CVD) and chronic obstructive pulmonary disease (COPD). The goal is to further develop individualised treatment and improve health care by building a nationwide, open-access, population-based cohort. SCAPIS will recruit and investigate 30,000 men and women aged 50 to 65 years with detailed imaging and functional analyses of the cardiovascular and pulmonary systems. The data is collected at six sites in Sweden (Uppsala, Umeå, Linköping, Malmö/Lund, Gothenburg and Stockholm). The study started in 2013 and have currently investigated over 15,000 men and women and is estimated to be completed by the end of 2018, at which point 30,000 subjects will have been included. The novelty and significant contribution of SCAPIS is that it combines size with extensive phenotyping. SCAPIS is a unique study made possible through a collaborative effort between six Swedish universities (Uppsala University, Umeå University, Linköping University, Lund University, University of Gothenburg and Karolinska Institute) and university hospitals (Uppsala University Hospital, University Hospital of Umeå, Linköping University Hospital, Skåne University Hospital, Sahlgrenska University Hospital and Karolinska University Hospital). Main funder of SCAPIS is the Swedish Heart-Lung Foundation and with considerable support from Knut and Alice Wallenbergs Foundation, Vinnova, The Swedish Research Council and the participating Universities and University Hospitals. The HeARt end brain failure iVESTigation group - HARVEST Background: While there have been significant advances in the therapy of congestive heart failure (CHF) in recent decades, such as the introduction of beta-blockers and antagonists of the renin–angiotensin system, the burden of CHF has risen globally and there is a major unmet need for identification of new causally related mechanisms and potential therapeutic targets for the treatment of CHF. Also, although a relevant proportion (26%) of CHF hospitalized patients has persistent cognitive impairment after discharge, little is known about the role of cerebral perfusion and function as a measure for end-organ perfusion in CHF. This despite the fact that cerebral perfusion is crucial in the development of dementia, in the maintenance of quality of life and for the compliance to optimal medical treatment which is the basis of all evidence-based heart failure treatment. Aims: The overall aim of this research proposal is to find new mechanisms and therapeutic targets independently associated with progressing CHF, thus suitable for further drug development and to gain knowledge of how to optimally treat CHF patients to avoid concomitant cognitive dysfunction or dementia. Workplan: A large cohort (n=2000) will be established and prospectively followed by clinical re-examinations and through well-validated Swedish national and local registers. Environmental, socioeconomic, and lifestyle factors will be characterized. Phenotypes will be analyzed in detail by noninvasive imaging to assess heart function (echocardiographical examination and cardiovascular magnetic resonance), cognitive function (cognitive tests, cerebral circulation measurements by cerebral oximetry (CBF) and hemodynamic response as measured by head-up tilt test combined with CBF. These data, in combination with an extensive biomarker program and full-scale genomic and metabolomic studies, has the potential to reveal new mechanisms and potential therapeutic targets for the treatment of CHF and prevention of coincident cognitive impairment or dementia. The study is ongoing (150 subjects enrolled). Significance: This study will give us great potential to find novel causally related mechanisms and potential therapeutic targets for the treatment of CHF and co-incident cognitive impairment/dementia suitable for drug development and also lead to knowledge about which blood pressure spans CHF patients should be treated in order to avoid concomitant hemodynamically induced cognitive impairment.